Who needs two wheels when you can ride around on one? 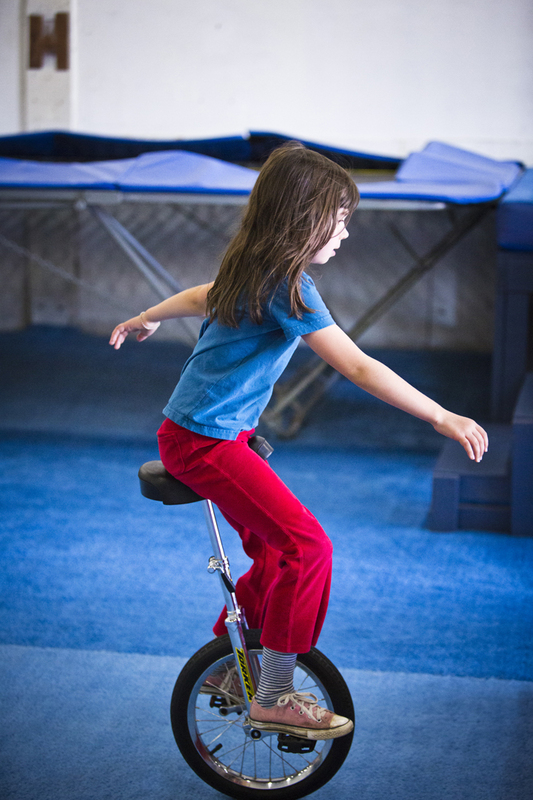 Unicycle coaches will tailor their instruction to the skills level of each student, ensuring maximum individual progress. For beginners, this class will help you gain the body control and muscle memory necessary to a unicycle. For intermediate and advanced students, this class will add to your preexisting skills, refine your technique, and provide instruction for more intricate tricks. Level 2 – Look, Ma, no hands! In this class we will work on free mounts, idling, riding backwards, hopping, obstacles, and juggling while riding either a standard unicycle or giraffe. Students will also work on advanced riding techniques such as wheel walking, one foot, over obstacles, group formations, and different sized wheels (12″, 26″, 36″). Prerequisites: Students should be able to ride independently across the floor, make a tight turn, and come back with out touching anything. Student should be able to ride forward and steer with control. Alternately, instructor permission. Level 3 – What CAN’T you do while unicyling? Students will work on advanced riding techniques such as wheel walking, one foot, over obstacles, group formations, and different sized wheels (12″, 26″, 36″). Prerequisites: Student should be able to free mount; idle; ride backwards; and should be able to ride independently across the floor, make a tight turn, and come back with out touching anything. Alternately, instructor permission.